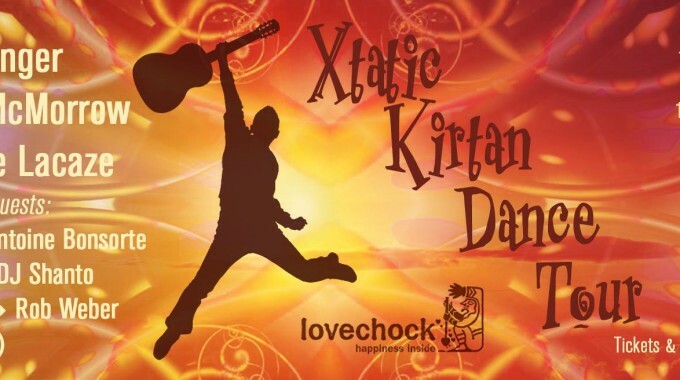 XTATIC KIRTAN DANCE TOUR - JUNE 10- JULY 3 WITH DAVE STRINGER AND MORE! => Stay tuned for event links! KIRTAN is a consciousness-transforming practice of mantra chanting, directing the singers to vanish into the song as drops merge into the ocean. The form is simple: a lead group calls out the melodies. The crowd responds, clapping and dancing as the rhythms build and accelerate. ECSTATIC DANCE is a free form conscious dance where movement expands, spirit activates, beauty flows and ritual is reinvented. The music weaves the threads of each individual into the fabric of a greater family. The goal is an experience of joyful union. The evening begins by connecting with breath and the heartbeat of creation by singing together. As the momentum builds, people become whirling galaxies of light. The evening reaches a conclusion in the transcendent stillness of meditation. "KirtanDance" is a hybrid form incorporating call and response chanting as well as ecstatic dance elements. "Live Ecstatic Dance" is a dance journey with live music.